-If you have Windows, you may prefer to download the zipped executable. Just click the link above, unzip the download and double click the application. -Alternatively, if you're a seasoned IF player, or you're using Linux or a Mac, download the .t3 version. Run the file with an interpreter from this page. You can find some extras (and some spoilers) here. The air is thick with smoke and precious little light seeps in through the grimy windows. The tables are cracked and uneven - deserted, save one that seats an old, grubby storybot. A cloaked form leans hunched over the bar, snoring quietly. The bartender, you presume. A relic from ancient times – a plastic figure vaguely resembling a woman. Its clothes have long since degenerated into rags. You notice a slot in its upraised palm, just the right size to accept a coin. The storybot sits slumped back in its chair, eyes closed. You are carrying a rusted six shooter and a handful of coins. You're wearing a heavy overcoat, a battered pair of jeans and some sturdy boots. You sit opposite the storybot and slip a coin into its palm. It twitches a couple of times and then opens its eyes with a dry click. With the hiss of unhealthy hydraulics, it sits upright and meets your eye. Its mouth drops open and a recorded voice emerges. "Hello. Would you like to hear a story?" "Yeah," you drawl, curious, but not that enthusiastic. The storybot's mouth flicks open again. "Perhaps you would like to hear the story of Mute Lawton? A quiet man with a passionate heart, he faced great odds with only a six shooter and a steady hand. An execution loomed over him like a black shadow, but his resolve was set." You look at the storybot more carefully. Could this old contraption have something to share other than the usual fairy tales of the Old World? Did someone reprogram it, or, somehow, did it learn new stories itself? 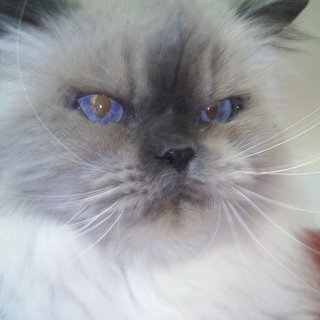 But its glassy eyes stare back at you stupidly. Just a machine. That's all. "Yeah," you say, trying not to sound as interested as you really are, "tell me about that guy." And then, to your great disappointment, the storybot starts to jerk epileptically, its head thrown back, its eyes flicking open and closed. "Error! Story not found. Please download TADS 3 game file or zipped Windows executable as required." You hit the storybot's plastic head with the palm of your hand. It ceases moving and slumps back into its chair. Damn it. That sounded like a half-interesting story. You quickly look over the storybot for a way to retrieve your coin, but it doesn't look like you'll be getting a refund. You still have enough change for a drink, though, and that is why you came here. Sighing, you stand up from your seat and walk over to the bar. Update: I'm surprised to realise that this game already seems to be all over the Internet. Read more at: Gnome's Lair, Indie Games: The Weblog, TIGSource, the IFDB, Jay is Games and Mobygames. But of course! TIGSource is my second home on the web (after this place). I'm still playing your shoot-em-up... just so you know. :-) Might get another go after supper. Sorry, took me a while to sit down and play it through. I think Gun Mute is brilliant. I felt like being in Trigun and El Topo in the same game. The pacing is great, the communication of how things work is crystal clear and the writing is...well...the expected Pacian level :). I hope someday I manage to achieve this closure in a game. If somebody asked me about IF, I would point them here (congratulations, you've made a mainstream IF game ;) ). Sorry anonymous, but I think that having a walkthrough on this page might spoil the game for some people. There's a walkthrough in the comments at Jay is Games if anyone is looking for one. I might get around to posting one myself at some point if there's a demand. i was intrested n te xizzny (or something like that) misshion but you got th the frist bit of that and then you got three turns and then eaten any one beat that side bit? The XYZZY is unbeatable. Just like in real life. So can I give money for GunMute? I think it was worth way more than free. I'm pleased you think so! I'm not really in need of money right now, but you can consider your kind comment payment enough. I played it, thoroughly enjoyed it, and introduced others to it here and there. When my computer got broken during a move, I lost a lot of neat freeware and shareware games that were very hard to find again... especially since I did not remember their names! I've been looking for Gun Mute, specifically, for at least a year now. You'd think that such a unique game would be easier to find! 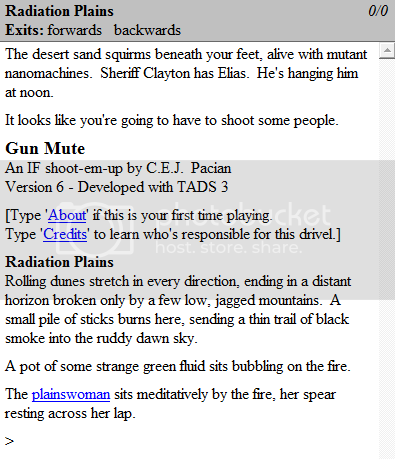 But finally, after Googling terms like "sci fi western text based," "shoot, reload, kiss, text based game," etc etc and finding the same dead ends over and over, I have found it!